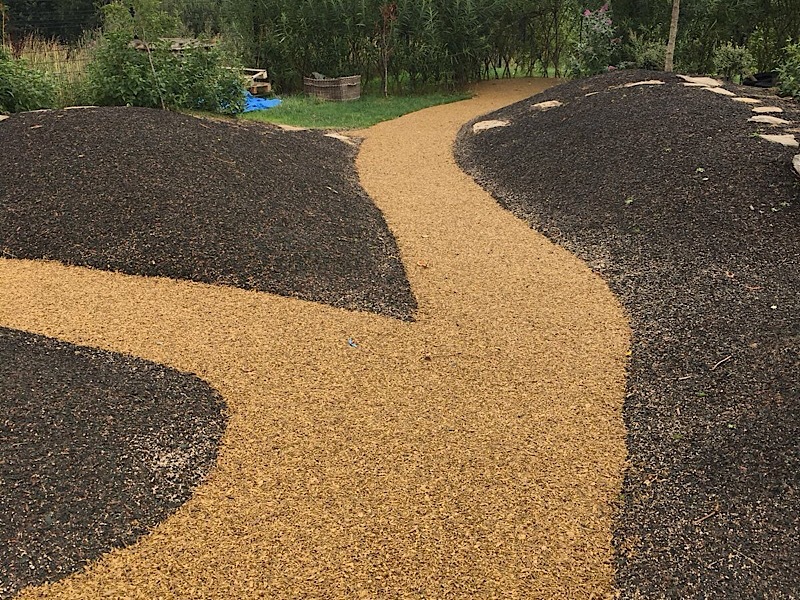 Our bound resin rubber mulch surfacing is ideal as an overlay to grassed areas. Quite simply we lay a weed membrane onto the surface and then ‘chase’ in the sides. This comprises a small cut into the turf to fold the mulch down to and then fold the turf back onto the rubber. Its environmentally friendly too. Made from recycled fork lift truck tyres (no metal) the rubber is chipped and coloured then mixed with a resin binder and laid onto the area with a metal float. Its a great solution with minimal fuss for installation. Please bear in mind that we will have a minimal call out charge for this, the resin and the mixer all take time to set up. The more you need, the better the price! This scheme is providing an all weather surface to a forest school area. We think it’s very fitting for the site and doesn’t look out of place in a natural setting when ‘Natural Play’ really does feature as the key theme.